Citizens Bank Park, the home of the Philadelphia Phillies, has added a number of new features for the 2018 Major League Baseball season, including a wiffle ball field for kids. 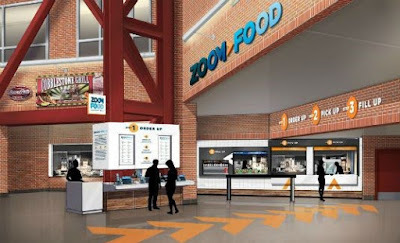 One new concept from last year, Zoom Food, is where gluten-free options can now be found. Zoom Food, located in Section 126, has a Wawa-style touch-screen ordering system. Gluten-free options at Zoom include cheesesteaks, hot dogs, pizza, chicken tenders, soft pretzels, brownies, cookies, chips, peanuts and Redbridge beer. Additional options will be added throughout the season. In addition, gluten-free Cobb salads, loaded nachos, vegetarian chili and brownies are now available at Harry the K's, while the Ashburn Alley Chickie's & Pete's Crabfries stand prepares only fries in dedicated fryers. There are several Rita's stands throughout the ballpark serving gluten-free water ice (Sections 106, 116, 132, 208, 220, 316 and Ashburn Alley), and Redbridge beer, Stella Cidre hard cider and Spiked Seltzer are available at various stands, including at Brewerytown (Sections 113, 139, 204, 209, 318, 323, 229). UPDATED 4/12/18: Due to popular demand, the dedicated stand has returned as a dedicated portable cart on the concourse level (Sections 125/126).